Glenn Miller is the cat's meow! Surprise! I'm your secret santa! When was this show on? The Dana Carvey Show was on during the spring of 1996 on ABC. What was this show known for? 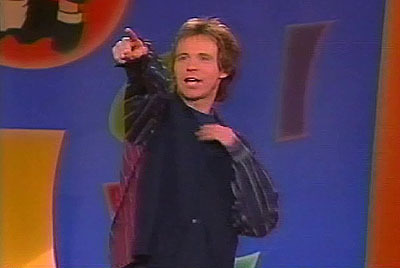 The Dana Carvey Show was famous (or infamous) because of skits such as Bill Clinton Breast Feeding, Beatles Anthology Outtakes, Bob Dole, Ambiguously Gay Duo, Grandma The Clown, Skinheads from Maine, Germans Who Say Nice Things, Waiters Nauseated By Food, and much more. The Dana Carvey Show has enjoyed a second life of sorts, as the rise of then-unknown-actors/writers Steve Carell, Robert Smigel, and Stephen Colbert has generated new attention. Why isn't it on the air now? The Dana Carvey Show was cancelled after seven episodes due to offending its sponsors, despite strong viewership ratings. In addition to watching episodes online, fans can now purchase The Dana Carvey Show on DVD! Purchase the The Dana Carvey Show on DVD from Amazon.com! Copyright 2006-2011, All Rights Reserved.